Today is the Ohio Scottish Games, in Wellington, Ohio. I had thought about going. Frankly, I preferred things when the games were in Oberlin, Ohio as it’s a trifle closer and it’s shadier. The Lorain County Fairgrounds are flat and surrounded on three sides by railroad tracks. The scene is spectacular, but there’s very little shade on the grounds and none on the car park. The sky, however, was dark black, and off to the west it was grey with a slight greenish tinge. This I took to be a sign. Not quite In Hoc Signo VInces, but rather, stay home out of the storms! The storms have come and gone, and I didn’t have to pay $15.00 to be wet. I did not see the highland cattle (and the poor things look like they are gonna wilt in Ohio summer heat) or get a corn dog (probably for the best, considering), but there are other times. The highland games are also where I first saw Alasdair Fraser, a fantastic Scottish fiddler, but, again, there will be other times. This evening, though, the cirrus clouds were caught by the sun, and were a luminescent pink against blue that looked like an oil painting that is sold in the motel by the freeway. It’s cool, it’s breezy, and you can tell it is summer, the first lightning bugs are out. I love the summer when berries and sweet corn and other crops come into season. Berries in particular but there’s lots of things that are seasonal. I like preserving things. It’s kind of interesting; you make the environment too hostile for bacteria in various ways. Most methods, including smoking, pickling, jamming make the local environment too dry, either by driving off the water (smoking) or by having such a hypertonic solution that no self-respecting bacterium can go about its business. I was at the West Side Market yesterday, and I bought $30.00 worth of mangoes. Yes, it’s time for mango chutney! As an aside, thirty dollars worth of mangoes is a lot of mangoes. The stand that had the best price was the one just off West 25th street, and my car was in the shade by the Hungarian church. Yes, I managed to have the furthest walk possible and no shopping trolley. As I stopped, I noticed two recruiters who had bought lunch, one Marine, one Navy, both O-3s. As I passed, the Navy lieutenant asked me if I needed some help. As she was a small blond woman, and I’m coming up on a BRN1 birthday, this damaged my ego somewhat, but I struggled on without her help. Or she could have been flirting—she could have been, but unfortunately no, she wasn’t. Be that as it may, I managed to get the mangoes to the car without further incident. The cutting and marinating have commenced, and I’ve just obtained some new, wide mouth jars. The chutney is chunky and aromatic, and the kitchen smells of mango, onion, cinnamon, ginger, and pepper. It’s sitting in the fridge now, and tomorrow will be put up in jars. The recipe is in the comments section. As a forensic pathologist, I have had to testify fairly regularly. Greg Davis of the Kentucky State Medical Examiner’s office has a wonderful rule, which I keep to “You [the pathologist] doesn’t have a dog in this fight.” (As an aside, he also has some podcasts, which can be accessed HERE). The forensic pathologist is (usually) a county or a state employee. The forensic pathologist is usually called by the prosecution, but he doesn’t work FOR the prosecution. You do develop a working relationship with the prosecutors, because you work with them time and again, but that it happens with any attorney you work with over time. I have been used as an expert by one defense attorney for four or five times now. It’s a good thing, he is used to my style, I’m used to his, and he knows he’ll get a good report in reasonable time. The defense attorney is important. You never realize how many people work for the prosecutor’s side until you look. The state has a much bigger budget than most people, and many more resources. A zealous defense is important in this situation. I’ve never minded testimony too much. It’s on the record, the prosecutor is there to object if things get out of hand, and most judges I’ve met don’t have a lot of patience for shenanigans. Finally, I’ve been yelled at (and graded) by humourless surgical attendings. Attorneys are restricted to parliamentary language, usually. They’re also not grading your performance. A zealous defense, however, does not mean harming the victim again. That’s what I disliked about Massachusetts State Representative James Fagan’s statement about what a defense attorney would have to do to a [six-year-old] child witness if the bill he was arguing against passed. The key graf is: I’m gonna rip them apart. I’m going to make sure that the rest of their life is ruined, that when they’re 8 years old, they throw up; when they’re 12 years old, they won’t sleep; when they’re 19 years old, they’ll have nightmares and they’ll never have a relationship with anybody.”and the full story is here. You gotta make the prosecution prove their case. You gotta make sure they’ve got the right person. To threaten to harm children again to do that (to save the perpetrator from draconian punishments, that was Mr. Fagan’s point) does not sit well with me. I will also point out that the good, competent defense attorneys don’t DO these things. Spend enough time around lawyers, particularly watching them in action, you can tell who you’d call if you needed one and who is a legend in their own mind. The bright ones, the ethical ones don’t revictimize the victims. It’s a good way to turn off the jury. It is sad how the murder victims, my patients, don’t really have anyone to speak for them as time goes on. There is no tradition of a Speaker for the Dead. Lester Adelson of the Cuyahoga County Coroner’s Office once referred to a forensic pathologist as the “family physician for the bereaved”. That’s a worthy goal, I think. By the by, Mr. Fagan’s contact information is here. He also chairs the Massachusetts House Ethics Committee. Both the LawDog and the Bayou Renaissanceman brought this to my attention. 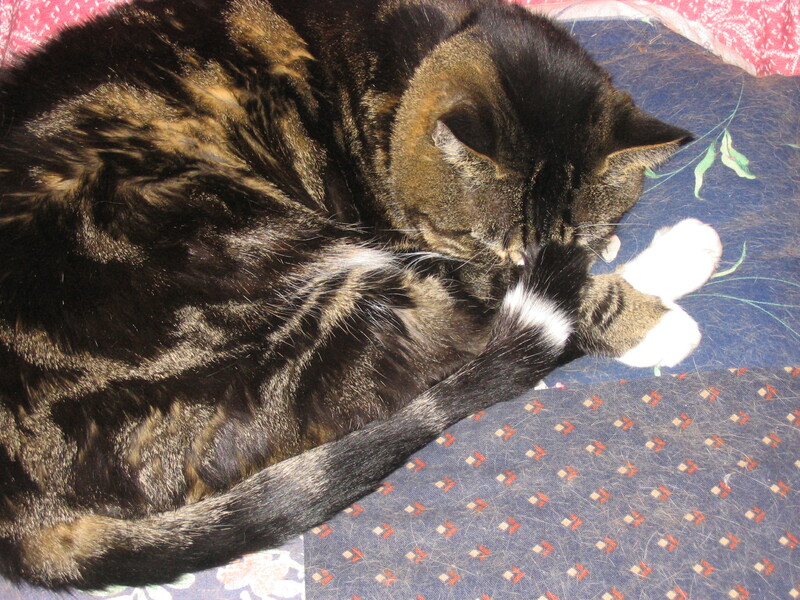 Like the title says, sappy cat blogging. I don’t know who either of these folks are, the guy in desert camo is in Iraq, somewhere. 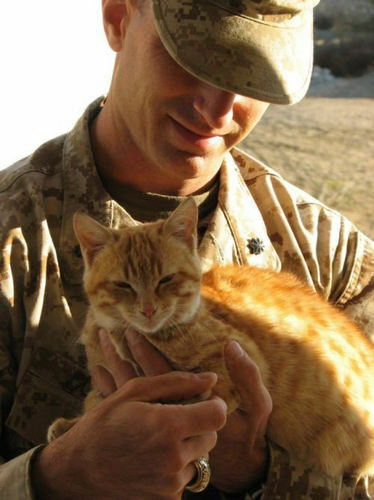 I think that would make the ginger one a Baghdadcat. 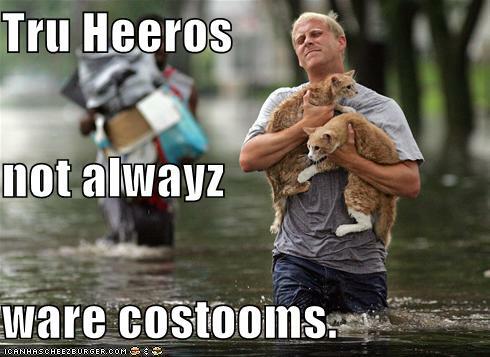 The flooding photo is, I believe, from Iowa via LOLcats. Evidently, redheads have a lower pain tolerance than people with other hair colours. Thus saith the BBC. I’m not sure how much I buy this. The authors of the study postulate differences in melanocortin levels are responsible for both effects. Cells that develop into the nervous system are derived from the ectoderm, referred to as neural crest cells. Foxes raised in captivity and undergoing selective breeding for tameness did also develop varigated coat colours, so a change in behaviour was correlated with a change in phenotype. Of course, correlation is not causation. Then, of course, there are the ethical (and safety) issues that arise when you go to study this phenomenon. Do you really want to go poking redheads with pointy sticks? What happens to the pointy stick that you poke the redhead with? Can it be retrieved from the experimenter without major surgery? All of that. I went and spoke to the owner of the vet clinic. I felt that something had to be said about how Murphy was treated, but there was no need to make a huge fuss. A quiet, polite word to the owner was in order. I’ve seen him in action, and the staff at this clinic has always been very good with the animals. The situation was an anomaly. Evidently, this person was a locum that they hired for the weekends, and they were very disappointed in how things turned out. I’m not exactly sure what the owner is going to do, he said he’d “Take care of it.” and how he does that is up to him. I’m not going to let the bad vet, if I ever see that one again, though I doubt I will, take care of my animals–it’s easy enough to reschedule an appointment. I do think the clinic owner is sincere and he really seems to like animals and have a good rapport with them. He’s also a smart enough businessman not to want long-standing customer badmouthing his business. Old advertizing. Hat tip, Lili. Not as snide as Lileks, but still interesting. I took Murphy to the vet this weekend, for well cat care. I did not have a very good experience. They were running late, which happens, you need to take the time you need to take. When the vet got to see Murphy (a vet I’ve never seen before) he got examined. I didn’t like the way it was done. The vet spent a lot of time hurting my cat, and I got the feeling that the vet enjoyed hurting him. Murphy’s a big, good-natured lunk, and usually his biggest problem is that he purrs so loudly you can’t hear the heart sounds. He stopped purring, and was shaking. Again, the vet had poor skills, and I got a bad vibe about it, it seemed to go on too long to be exactly kosher. I think I’m going to call the owner of the clinic. If the vet had been a medical student of mine, that person would not have passed the rotation. Author/illustrator Tasha Tudor is dead at age 92. She was known for her folk-art style of delecate watercolours. One of my favourite books of hers was Take Joy, her Christmas book titled after the Fra Giovanni poem. Why in my day we used to get nostalgia at the corner store for a nickle, and it wasn’t these wimpy little bits of nostalgia you get nowadays, but you could get a great big hunk of nostalgia back then for a NICKLE!